Avid Collector, Andrew Hawley, announces his search for original boxing style 1955 Bill Haley Himmelreich’s Grove concert posters. Haley parlayed his cowboy yodeler fame by introducing America to rock n’ roll in the early 1950s. The 14 x 22 inch poster uses bright colors and a stock picture of the band to advertise the show. Avid Collector, Andrew Hawley, announces his search for original boxing style 1955 Bill Haley Himmelreich’s Grove concert posters. Haley parlayed his cowboy yodeler fame by introducing America to rock n’ roll in the early 1950s. According to Hawley, “Haley started his career as a fairly successful western swing band leader for in the late 1940s. In 1951, he started experimenting with rockabilly music. The Comets used a slap bass since for percussion since they did not have a drummer in the band. The Himmelreich’s Grove concert was held near Womelsdorf, Pennsylvania on May 22. The poster is a classic boxing style boxing poster. The 14 x 22 inch poster uses bright colors and a stock picture of the band to advertise the show. It was printed by Poster Inc. based in Philadelphia. Haley’s mega hit Rock Around Clock was not included on the poster because the single was released while the poster was being printed.” For an example of boxing style concert posters, go to [http://www.vintageconcertposterbuyer.com/boxing_style/index.html. 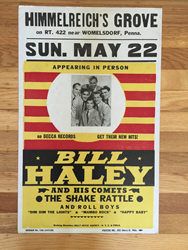 If you have an original 1955 Bill Haley Himmelreich’s Grove concert poster, Hawley is willing to pay $3,000 cash. Any condition accepted. Please call 310-346-1965 or email andrew (at) vintageconcertposterbuyer.com.